The film Lilies of the Field, released in 1963, a wandering ex-G.I. stops by a farm being run by five German nuns and agrees to help them out with various and sundry tasks and chores. At their insistence, he stays on to build a chapel for them, and the nuns are sure that he is a miracle sent from God. Frankly, the real miracle here is that this movie got made at all. it was nominated for four Academy Awards, including Best Picture. 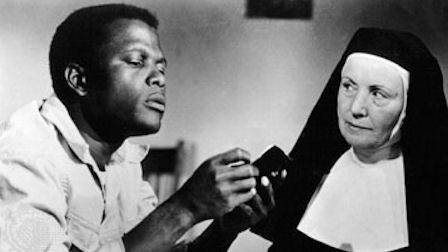 Moreover, Lilies of the Field achieved motion picture history as Sidney Poitier was awarded the Best Actor Oscar, marking the first time in history an Academy Award was awarded to a black man.